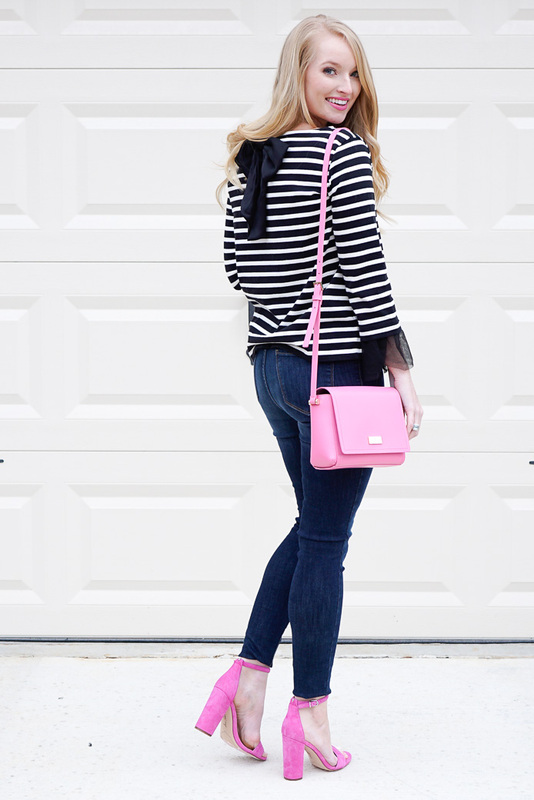 It’s no secret I love pink and bows around here, so this outfit is probably one of my top 5 favorite looks I’ve styled on the blog. Unfortunately, the weather only let us shoot about 15 photos before it rained but I luckily had enough pictures to share! You may recognize my bow from this post where I wore it in my hair and shared my tips to growing out your hair, but the great thing about it is you can also pin it only a top or skirt because who doesn’t love a well-placed bow. This fun top has been off and on re-stocked in limited sizes. Right now it’s available in a small, which is what I’m wearing here but I think I could have also got away with a xs. 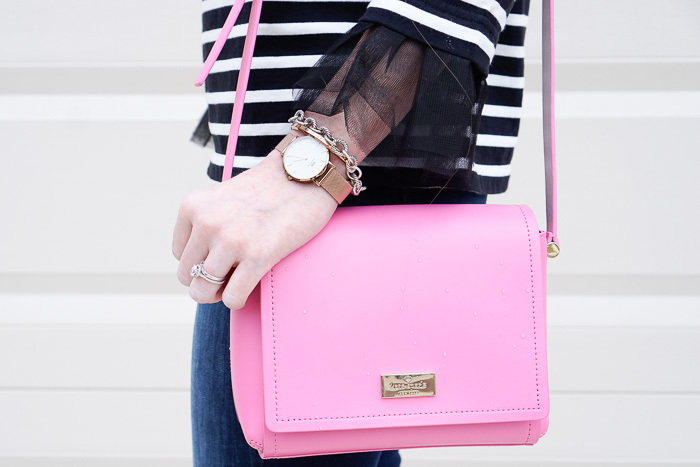 I just love the fun tulle sleeve! 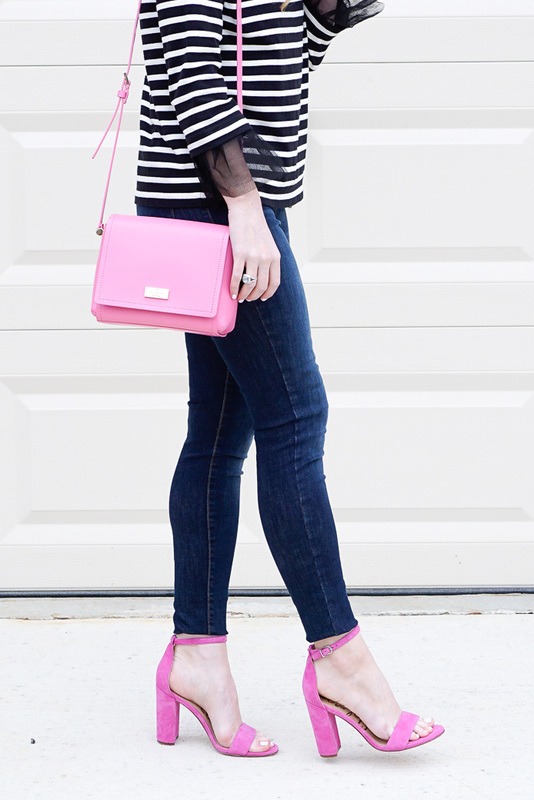 If you’re crafty I think this could also be a simple DIY to any striped top. These shoes run a little big in my opinion, so if you’re usually between sizes like me then go with a half size smaller. My bag was recently purchased at a Kate Spade outlet, so if you have one nearby you can shop this little cutie! I linked a similar pink bag from the same brand on sale in the widget below. I love these tulle sleeves! Such a fun take on the bell sleeve trend. and those pops of pink are perfect! I love the pops of pink! Perfect look girl! I am loving the pops of pink and I def want to grow out my hair! It feels like its been taking years! Now I just need to learn how to make it thicker! Such a pretty top with the tulle sleeves. Love the pink accessories! 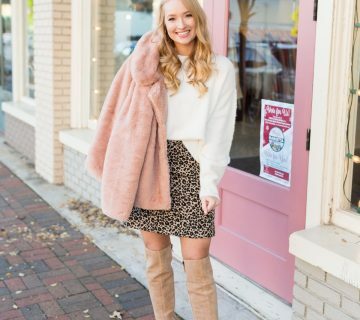 Seriously swooning over those pops of pink! The pops of pink are too fun! Love the pretty pops of pink! I need those shoes! This is too cute! I love that top! The tulle and bow back are so cute! The pop of pink adds the perfect finishing touch! Such a great bag! Love that shade of pink! I love your pops of pink! 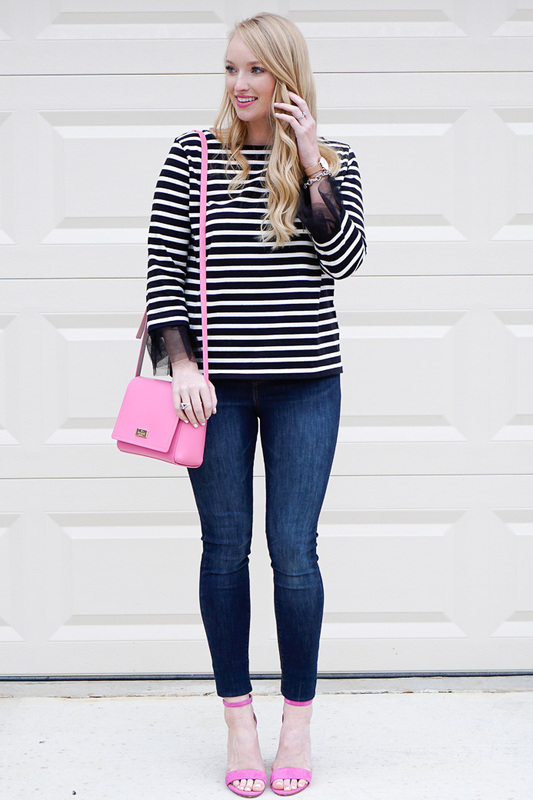 The tulle details on the sleeve are so much fun! 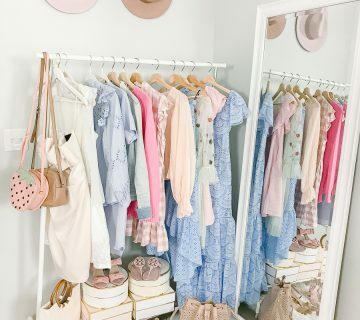 I love that lately fashion is embracing feminine and girly details! That sweater is too cute! I love the tulle and bow details.